With MCP transactions being handled through the Ethereum Blockchain, payments are straight forward. Like anything else, it can also be confusing, especially for beginners. We have all been there! You will see the current price 0.448xxx Ether and just press BUY and metamask, or your preferred wallet, will then give you the option to check the price and set a GAS / GWEI rate. Right hopefully everything went smoothly and you now have your first slice of the virtual land pie! OOOPS.. something went wrong! I don’t have my land but it took my money!!!! This is an issue many might come across when trying to spend our Ether. It is a common complaint from people in Discord and Telegram channels. So this is why I want to address it and hopefully explain the reality. If you don’t want to watch it, I will explain it in simple terms. You can not ever lose your Ethereum… (as long as you send it to the right address) You either get your Ethereum back (minus some gas) OR you get your land! It can’t be any other way. The transactions can not be tricked, manipulated etc, it is an exchange of goods on a Smart Contract. 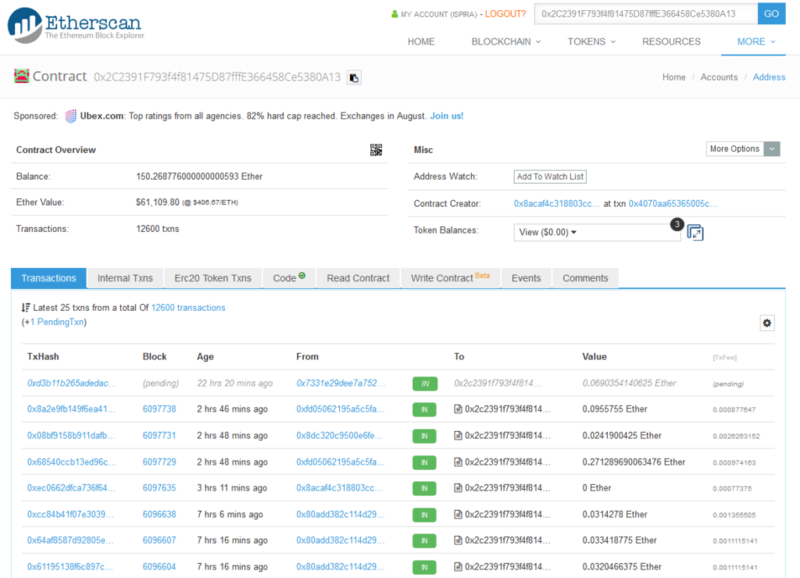 If you need to be sure, you are best to find out your transaction usually from within your Metamask or other wallet, and clicking through to https://etherscan.io/ and it will show you the transaction. If it is not showing in your Metamask or chosen wallet, find your public ether address from your wallet, and search this address in etherscan. There are a few reasons why your payment did not transact in MCP. It is most common when a new district opens and many players are trying to get cheap land. Due to many players all trying to buy land in the same regions, only the transaction that gets through 1st will be successful. 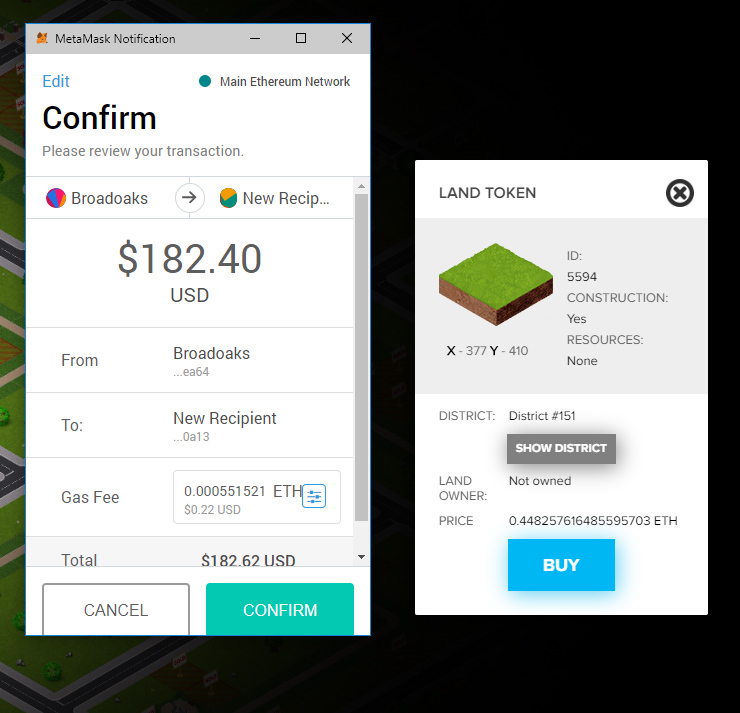 Due to the price of land increasing in nearby tiles and because the blockchain can not be manipulated, all other transactions at the old price will fail 🙁 This can also happen when players want to buy a 2×2 area.. they need to wait for each transaction to complete before buying the next one. Other reasons might just be “out of gas” due to going over the gas limit or network congestion. Great, I got my 1st piece of virtual land 🙂 – Now how do I get paid?! There are a few income streams, one from neighboring land sales. You will get paid 12.5% of your buy price for each neighboring sale. This means that when 8 nearby tiles are sold you break even. Another way is from buying and selling land at a profit. And the most obvious way is from building on your land an generating influence.